Wanganui Open Studio Glass Artists - Barbara Bullock. Saturday 17th & Sunday 18th March 2018. Saturday 24th & Sunday 25th March 2018. 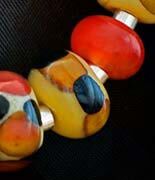 Flamework bead making will be taking place during various intervals on each of these days when you visit. There will not be lessons available during these times. However bookings will be taken during Artist Open Studio for on coming weeks. Bookings are essential. Price will be $100 including GST per person - up to 4 people for a 2 hour session. $120 per person for individual lessons. You will be able to make up to 10 beautiful glass beads. You can find me on page 29 index 63 of the new Artist Open Studio booklet. STUDIO LOCATION: 13 Toi St, Wanganui – Top of hill. Parking available at bottom by old shed.